Our Core Concept Videos help you learn the basics of handgun safety and operation. When you're a new shooter, it's important to get an experienced instructor to help you with these videos. Don't try to learn to shoot by yourself until you're thoroughly familiar with firearms safety, and understand the basic operations of your handgun. Rule 1 – Treat every gun as if it is loaded. Rule 2 – Keep your gun pointed in a safe direction. Rule 3 – Index your trigger finger until you are on target. The 5 steps for unloading a semi-auto pistol and making it safe to handle. The 3 steps for unloading a double-action revolver and making it safe to handle. How to load a semi-auto pistol and make it ready to shoot. The correct way to operate the slide on a semi-auto pistol. How to load a double-action revolver and make it ready to shoot. How to grip the gun like the jaws of a clamp. The basic shooting stance and ready position that get you ready for anything. How to aim your gun accurately by focusing on the front sight. How to dry-fire practice at home using our Basic Dry-Fire Exercise. How to practice shooting using our Basic Live-Fire Exercise. This is just our Basic Dry-Fire Exercise, combined with live rounds. How to get the maximum training value out of your practice time at the range. How to practice drawing from a holster with our 5-step Basic Holster Exercise. How to draw from an outside-the-waistband holster. The extra moves needed to draw from concealment. Drawing from an inside-the-waistband holster concealed carry holster. The five basic questions to answer when selecting your handgun. Answering these questions is the best way to find the handgun that’s right for you. After you’ve selected some guns you like, the real test is to shoot the guns at the range. Why it's important to keep your handgun clean. 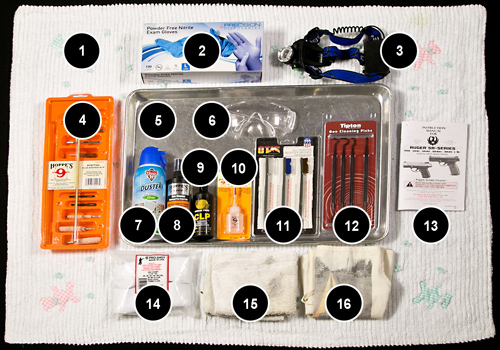 The five steps for cleaning your handgun using our Basic Handgun Cleaning Kit. Includes close-up photos to help you identify gun parts.